Scallops or hotate in Japanese is a type of shelf fish that is gathered in Japan between the fall and winter months. They are prevalent in areas such as Hokkaido and the Tohoku region. Scallop is high in vitamin B12 and folic acid in addition to containing taurine said to be helpful in reducing cholesterol. The calories in Scallops per 110g(1item edible peeling) is 79 calories. 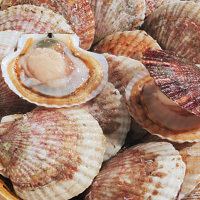 Scallops is calculated to be 72Cal per 100 grams making 80Cal equivalent to 111.11g with 14.85g of mostly protein、1.65g of carbohydrates、0.99g of fat in 110g while being rich in vitamins and minerals such as Vitamin B12 and Folate.